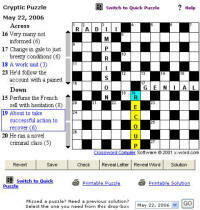 We produce puzzles in website-ready java format, and supply our (copyright!) system to rotate the puzzles automatically. Printable web pages are also provided for readers who wish to tackle the puzzle away from their PC. The price includes processing, and is negotiated according to likely website hits and to the length of contract, e.g. Send mail to webmaster@xwords.net with questions or comments about this web site.